Vitashine is the world’s first fully Vegan and Vegetarian suitable Vitamin D3 (Cholecalciferol) source of Vitamin D3 from plant, registered with the Vegan Society and Vegetarian Society. Vitamin D3 has been associated with a huge number of health benefits, yet a large proportion of the population even in Europe and North America are deficient in this key nutrient. Commercial Vitamin D3 is available from animal sources (usually Lanolin or fish). The common vegetarian alternative is Vitamin D2 (ergocalciferol), but this is a synthetic derivative and the absorption and efficacy is not considered to be anywhere as effective as D3 by the majority of the Scientific community. Vitashine uses 100% plant-source Vitamin D3, with the levels of Cholecalciferol proven in the starting plant material, throughout the careful processing steps and in the final extracted oil. Diglycerides of fatty acids (coconut source), Cholecalciferol, Natural Vitamin E.
Spray directly into the mouth or onto food. 1 spray is 5mcg vitamin D3, which is 100% EU RDA. 1-5 Sprays per day. Suitable for pregnant or lactating women and children. 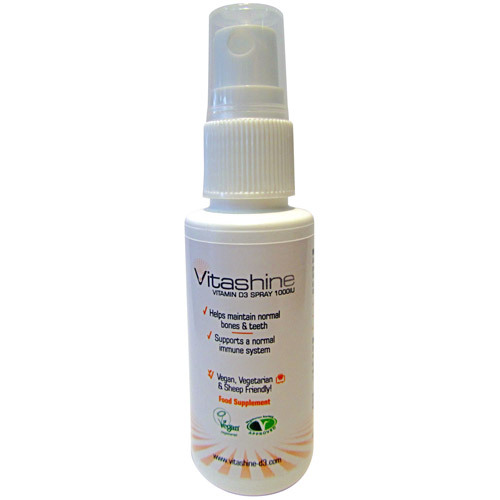 Below are reviews of Vitashine Vegan Vitamin D3 1000iu Spray - 20ml by bodykind customers. If you have tried this product we'd love to hear what you think so please leave a review. 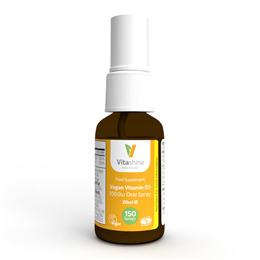 The only 100% natural vitamin d spray I have found. Most contain sweeteners or animal products (gelatine). Easy to take and mild pleasant taste.